Want to get your hands on James Franco’s package? Two California outfits, The Thing and Quarterly.co, will mail you (through the Postal Service!) delightful, whimsical gifts curated by the likes of Miranda July, Dave Eggers, Jonathan Lethem, and, yes, the enigmatic one himself. Here’s how to sell analog twee to a nation of tweeters. As you’ve probably heard, the United States Postal Service is facing some of its toughest challenges in decades with estimated losses of $10 billion this year and the House of Representatives approving a bill that could end deliveries on Saturdays. And while this is terrible news for every birthday boy and girl waiting for a crisp $20 bill in a card from grandma, for the rest of us life goes on. It goes on in the digital insta-verse: faster, more efficient, better for trees, sure, but also a smidge less wonderful? Who, after all, doesn’t still get a tingle up their spine on those very odd days when a package (not from Amazon or Zappos) is there when they get home from work? Zach Frechette, founder of Quarterly Co. is hoping to bring a little wonder back to your mailbox by launching a subscription service for physical artifacts. For a $25 fee, subscribers receive packages every three months that have been hand selected by Quarterly Co. partners like Siobhan O’Connor and Alexandra Spunt, co-authors of the book No More Dirty Looks and Alexis Madrigal, a senior editor at The Atlantic, reflecting each contributor’s sensibilities and passions. While none of the contents have yet been announced, they will range from curated consumer products to specially made objects sent directly to subscribers the old-fashioned way. Quarterly.co isn’t alone in the nascent objects subscription business. The Thing Quarterly, launched in 2007 by San Francisco artists Jonn Herschend and Will Rogan, brings together contributors like Miranda July, who designed a word-art window shade, and James Franco, who created a limited edition “Brad Renfro Forever” switchblade in honor of his friend, an actor who died of a heroin overdose in 2008. Dave Eggers and Mike Mills (the filmmaker and July’s husband, not the R.E.M. bassist) are being tapped for future issues. Annual subscriptions for The Thing are $200, and, according to Herschend, the subscriber base hovers around 500, with a brisk business of non-subscriber one-off sales. 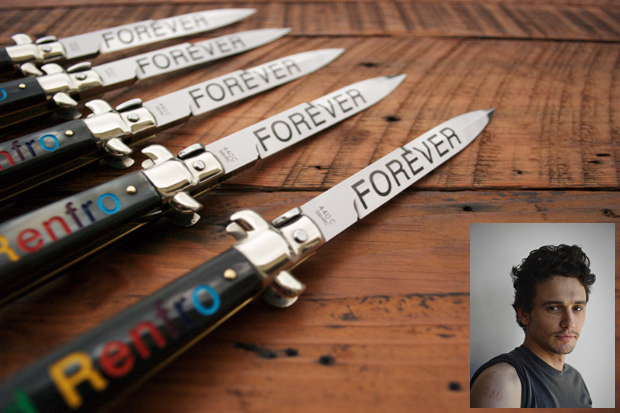 Want that Franco switchblade? It can be yours for $650. goes so far as to wear issue 7, a pair of eyeglasses printed with text by author Jonathan Lethem. Frechette summoned similar feelings of personal connection and nostalgia while launching Quarterly.co in Los Angeles. In an introductory Tumblr post headlined “Why I’m Starting Quarterly Co.,” Frechette recalls the pleasures of receiving a care package at summer camp from his mother, an expert at hiding contraband in seemingly mundane sundries. Follow Matt Haber on Twitter, and Fast Company, too.